Sandy has come and gone, but certainly won’t be forgotten. Good-bye to a not-so-nice lady! I’m so thankful that we came through it in good shape. Our only hardship was the loss of electricity for about 48 hours. Compared to other families who suffered extensive damage and even loss of life I feel particularly lucky. The shorelines of Ct., New York and New Jersey were devastated and it will take a very long time- if ever- to get things back to normal. In preparation for the super storm and the likelihood of not having any power for some time, I roasted a chicken so I would have some meat to work with in creating other dishes. That worked out well because I have a gas stove so we were in pretty good shape. 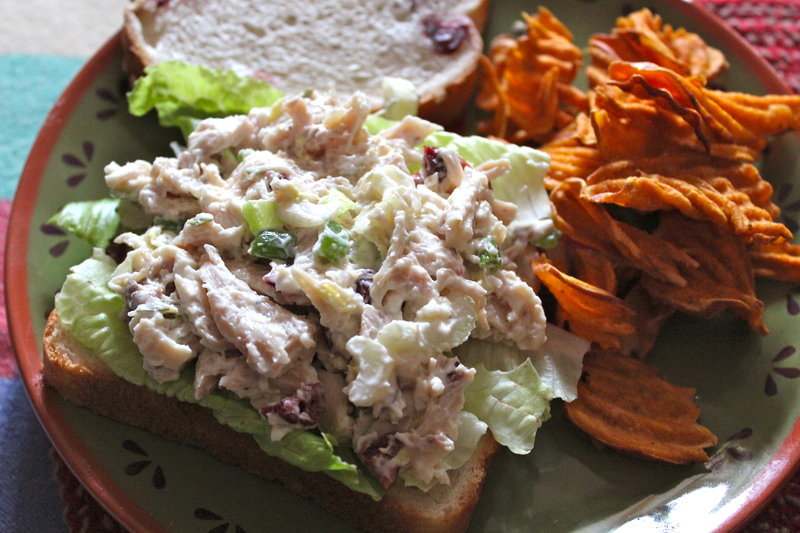 One of the lunches I fixed was this recipe for chicken salad sandwiches. Usually, when I make chicken salad I put in a little dried tarragon, along with the chopped celery, and green onion. But this time I also added some dried cranberries. The inspiration for this came from the fact that on my last trip grocery shopping I found a loaf of Cranberry Wheat bread. This is available for a limited time from now through the Holidays, and I thought it would be good toasted, but it also worked out very well as a backdrop to the chicken salad. 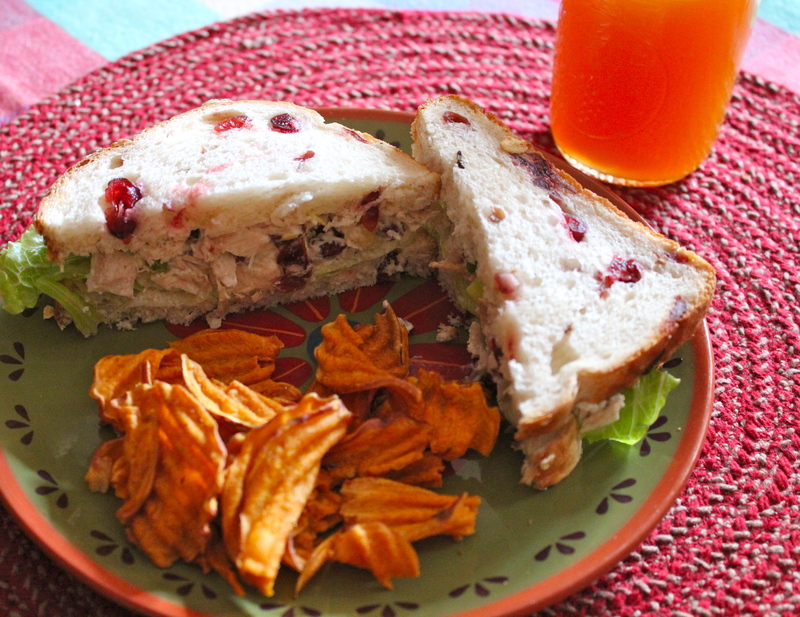 I served these yummy sandwiches with some sweet potato chips and apple cider. For two people in the midst of a hurricane, this was quite a good lunch, if I do say so. If you decide to try this, try to find bread or rolls with either cranberries or orange in it. That seems to elevate the sandwich to something a little more special. 1/4 cup mayonnaise, or more as needed to moisten it all. Bread or rolls of choice, preferably with added cranberries. Sweet potato chips make a nice accompaniment. 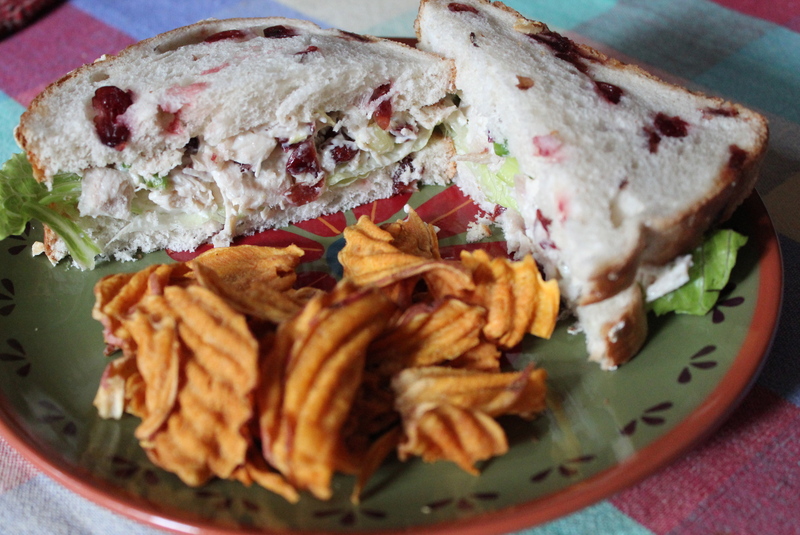 Substitute some of that left-over Thanksgiving turkey in place of the chicken, for another variation on this sandwich.